article by Bruce Lemer, Vancouver lawyer with 30 years experience dealing with personal injuries from car accidents and ICBC claims. While the common view of soft tissue injuries is that they are less severe than fractures, whiplash and other ligament, tendon and muscle injuries can actually be severe and long-lasting. It can take hours and days after an accident for soft tissue damage to become fully apparent. A physician should determine if there are signs or symptoms of an additional spinal cord injury, and may recommend x-rays, a CT scan or MRI. 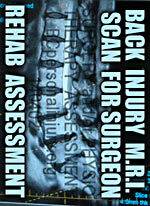 Spinal injuries, such as ruptured or bulging discs and fractures require special care. For purely soft tissue, whiplash and related injuries physiotherapy, massage therapy, chiropractic treatment and exercise are often recommended. ICBC “no-fault” or ”Part VII” payments cover medical expenses not otherwise paid by the Medical Services Plan. Whiplash, back injuries and other soft tissue injuries can take months to recover and it is best not to rush settlement of an injury claim. Settlement negotiations and mediation should wait until the prognosis is known. Lawyers for insurance companies often say that, when CT scans or MRIs show that spinal degeneration existed before an accident occurred, the injured person would have had back pain in the future even if the accident did not occur. They argue that the accident simply caused the pain to occur earlier than would have been the case had the accident not occurred. In fact, some research has shown that many people without neck and back symptoms have MRIs or CT scans that show degeneration. Therefore, accident victims might very well have been without any back or neck pain had the triggering accident not occurred. Bruce Lemer is a Vancouver personal injury lawyer who has been counsel in many actions involving soft tissue, whiplash and back injuries since 1982. He ensures that all necessary medical evidence is obtained to prepare your case. Where appropriate, he will retain independent medical experts and arrange private MRI’s or CT scans to avoid the long wait in the public medical system. He generally covers all expenses and is paid only when a settlement or judgment is obtained (known as a contingency fee or percentage fee arrangement). An experienced auto accident lawyer will ensure that you obtain appropriate damages for your injuries. Bruce Lemer has thirty years experience as a motor vehicle accident lawyer in British Columbia and has the expertise and resources to represent you properly. Legal disclaimer: The information provided on BCpersonalinjury.org is not intended to be legal advice, but merely conveys general information related to legal issues commonly encountered.